If our bodies and minds aren’t running at optimal levels, we can’t and won’t reach our human potential. Part of the process of making improvements from a physiological perspective is breaking things down (like muscles) to then let the body repair itself bigger and stronger (hypertrophy). Over the past year, I have discovered a secret weapon for my training and competition. It started with trying to rehab and recover from a specific injury, but what happened next was the breakthrough in my training protocols. During a jiu-jitsu class I was stacked and pulled some muscles in my lower left back (upper left glute) that left me unable to train for a good stretch (I couldn’t do anything for days including dress myself or move around to function as a human). I ended up trying a variety of rehab protocols that included but were not limited to massage, ice, electric stimulation, and chiropractic services. I eventually sought out physical therapy to get me back on track as fast as possible. What I eventually learned through the experience led to a major breakthrough in my training and competition performance. 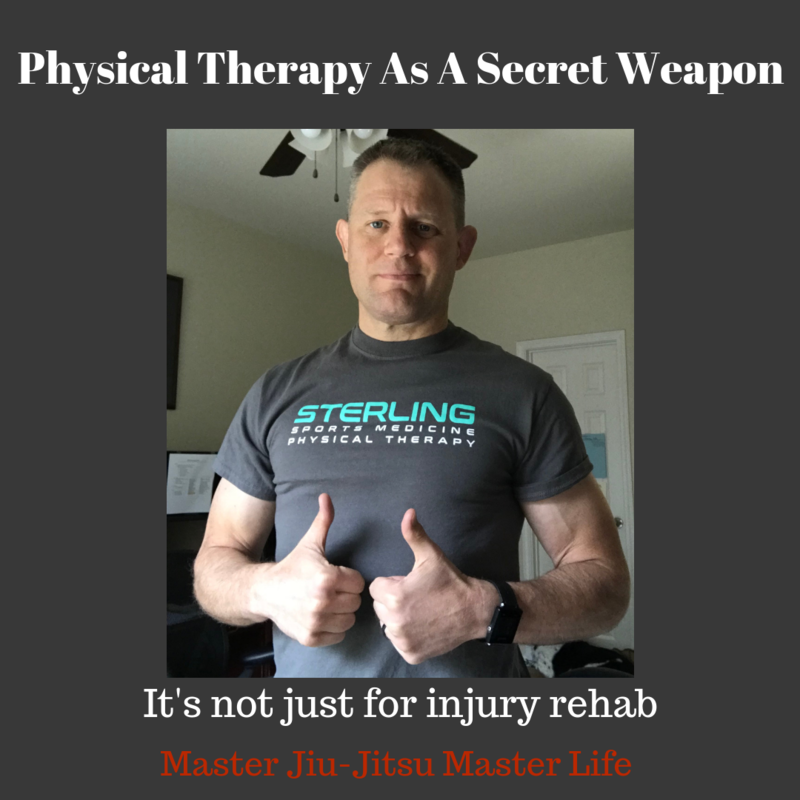 I visited a high-level local sports medicine and physical therapist at Sterling Sports Medicine & Physical Therapy in Suwanee, GA. What Julie Brooks-Sterling helped me realize is that my body was a ticking time bomb on sports-related injuries. Simply, my muscles were unbalanced, tight, weak in some areas, over-developed in others, I had adhesions, and a significant lack of mobility and flexibility in many areas. What I discovered is that if I used physical therapy PROACTIVELY as an offensive weapon in my training, I greatly decreased the probabilities of injury while training and competing. Specifically, if I worked on muscle imbalances and areas of weaknesses and smoothed those areas out, I would reduce the strain on that entire chain of physical requirements. Going proactively to physical therapy (when I was healthy) allowed me to work on my flexibility and what I call pliability. My muscles learned to move better, joints began to work more naturally and freely, and my jiu-jitsu game improved. We know from other proven principles of success that consistency and momentum are also important factors in achieving goals in any endeavor (jiu-jitsu included). If you want to be good at something (really good at something), you must train and practice over long periods of time. That can’t happen if you are injured or on the sidelines. Thus, managing workload, recovery, and injury prevention becomes critical if you are striving to reach your human potential in any athletic endeavor whether that is swimming, running, weight training, gymnastics, or jiu-jitsu. We must consistently train and improve. I’ve been lucky enough to find Sterling Sports Medicine & Physical Therapy which is very close to my place of residence. You may have to find a good sports therapy practice near your residence or place of training. It’s worth it. It has definitely become my secret weapon in staying on the mats, putting in large blocks of training volume and then making sure I am proactively reducing the chances of injury while chasing my goals and objectives. My only regret is that I learned the importance of this training protocol much earlier in my athletic life. It would have been a game-changer.